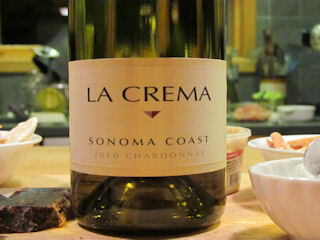 La Crema Chardonnay Sonoma Coast comes from Santa Rosa, CA and is one of La Crema’s most popular releases. They also compare the growing region of La Crema Chardonnay to be similar to the Burgundy region of France. Primarily due to the long, cool and even growing season. Knowing that I recently reviewed and enjoyed the La Crema Sonoma Coast Pinot Noir, my Mad River Glen tasting assistants from the Charles Krug Cabernet review recommended we review La Crema Chardonnay. The wine poured golden in the glass and demonstrated “serious legs.” Much more than expected. The wine’s nose was of citrus and oak. The aroma was noticeable from over a foot away from the glass. La Crema Chardonnay alcohol content 13.8% by vol. On the palate, we each experienced different and enjoyable flavors. Put together, we noted a buttery clean taste that included hints of pear and mango. Also noted was that the taste was crisp and well balanced, with oaky flavor typical of a good California Chardonnay. Overall we all enjoyed this wine. It complimented our pairing of dry cured goose breast and goat cheese. A pleasant combination! We determined it’s a good sipper on its own and we felt it would go great with scallops or anything with a cream sauce. This wine has enough well balanced acids to pair nicely with a buttery sauce. La Crema’s recommended pairings include Crab Risotto, Chicken Curry, Spring Allium Soup and Pork Cutlets. La Crema Chardonnay price $22.99.